our ever-growing highway and traffic problems." 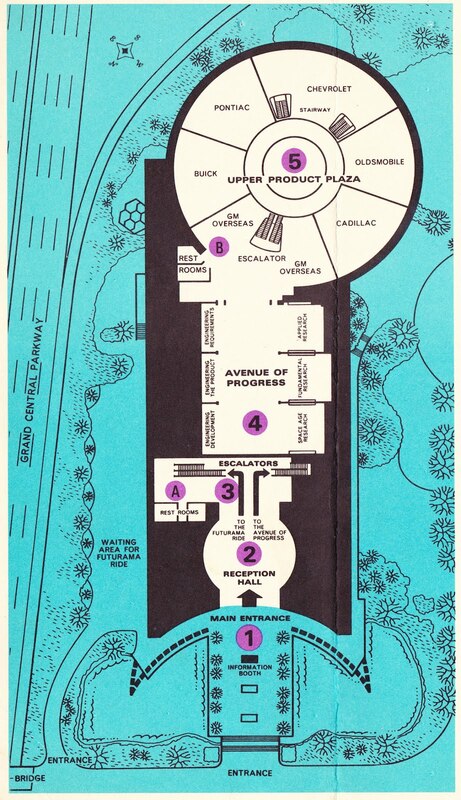 The two maps below appear in a tri-fold brochure titled "Your Guide to the General Motors Futurama New York World's Fair 1964-65." There are showcase areas highlighting Buick, Pontiac, Chevrolet, Oldsmobile, Cadillac, Detroit Diesel, United Delco, AC Spark Plug and more. 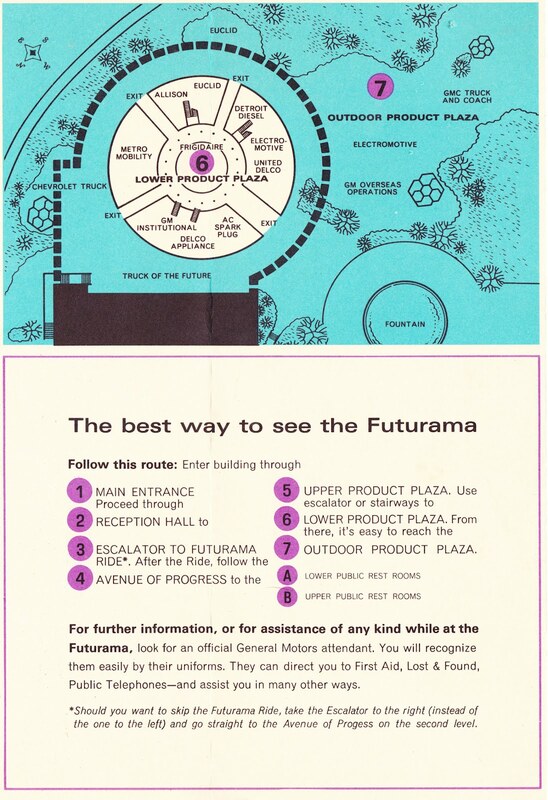 Futurama, which followed in the footsteps of the first Futurama (at the 1939 New York World's Fair), was the most popular attraction at the 1964-65 World's Fair. According to nywf64.com, it had a total attendance of more than 29 million visitors, setting a World's Fair record by surpassing the 24.2 million who visited the GM "Highways and Horizons" exhibit in 1939-40. "Perhaps the most popular of all three Futurama attractions is the Ride. On an average day, about 70,000 people will take this intriguing quarter-hour trip into tomorrow. The Ride moves continuously and can accommodate 5,500 people an hour. Once aboard, you relax in your individual lounge chair, and, as you are transported on the fifteen-minute tour into the future, you hear a running description of its wonders over your own special stereo sound system." "And interesting sidelight is that every bit of the spectacular Ride was built and assembled in Detroit — then disassembled, shipped, and reassembled at the Fair site. More than 1,500 shipping crates were required to hold his Ride material." For more information, check out nywf64.com's General Motors Pavilion page and the Westland Network's "Showcasing Technology at the 1964-1965 New York World's Fair". Finally, if you want to get a taste of what the 1964-65 New York World's Fair site is like now, I highly recommend "What Remains of the 1964-65 New York World's Fair?" on ImagineeringDisney.com. If you were one of the 29 million people who went through Futurama, please share your memories in the comments section! I watched the video and it all came back to me...but I liked the GE pavilion/exhibit better. And of course, we just watched all of this in a movie!